GET READY TO GO BANANAS - THE CHEEKY MEGALOMANIAC MONKEYS ARE BACK! Combines engaging gameplay with hilarious antics - certain to make you laugh out loud! More ingenious ape-catching gadgetry and vehicles than you could ever wish for! Play three of the greatest mini games ever, including Monkey Football! 02-06-2016 metshael Box Text GO APE! GET READY TO GO BANANAS - THE CHEEKY MEGALOMANIAC MONKEYS ARE BACK! Hikaru must track down the funniest 'n' feistiest primates around before they can take over the world. But this time they've got some impressive new tricks down their pants... Combines engaging gameplay with hilarious antics - certain to make you laugh out loud! More ingenious ape-catching gadgetry and vehicles than you could ever wish for! 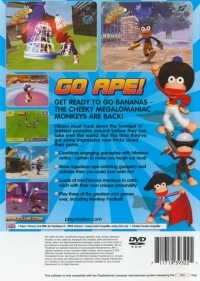 Loads of mischievous monkeys to catch, each with their own unique personality Play three of the greatest mini games ever, including Monkey Football! 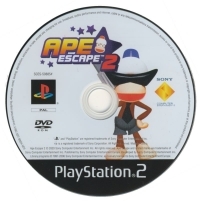 This is a list of VGCollect users who have Ape Escape 2 in their Collection. This is a list of VGCollect users who have Ape Escape 2 in their Sell List. 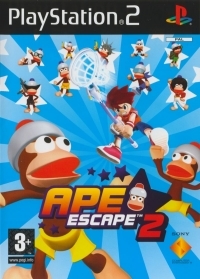 This is a list of VGCollect users who have Ape Escape 2 in their Wish List.